We wish the new owner of a 1955 Vincent 998cc Black Prince Project 'Happy Birthday' as the hammer at Bonhams strikes at a record-breaking $154.328. Bonhams annual Summer Classic Sale saw $4 million of automotive classics go under the hammer in London this past weekend. A record was broken as two phone-bidders battled for a bike, both bidders apparently having a personal attachment to the 1955 Vincent 998cc Black Prince Project resulted in the lot selling for almost four times its estimate at a high $154.328. One bidder owned a Black Knight in his youth but always longed for the superior Black Prince, the other (winner) shared a birth year with the bike, and wanted to gift himself the Prince for his birthday. The bike became the top lot of the motorcycle sale and set a world record for a Black Prince sold at auction. Bonhams Director for Motorcycles, said: “This years sale was outstanding – an electric atmosphere, and delighted sellers and bidders. With a 93% sale achievement and 115 lots sold, it was certainly our best ‘Banbury Run’ motorcycle sale to date.“ Many exceptional models were included in the sale – some of which hadn’t been up for public sale in decades. Allround the Vincents fetched high prices, the Vincent quadruplets all sold over their estimate, with the 1951 Vincent 998cc Black Shadow project achieving $91.500; a further $47.800 for the 1951 Vincent 998cc Rapide project, and the 1952 Vincent 998cc Rapide project achieving $39.000. Owned by the legendary Myerscough family, the 1928/31 'Golden Age' Brough Superior Overhead 680 achieved $56.500, and the 1935 Brough Superior 1,096cc 11-50hp secured $81.800. 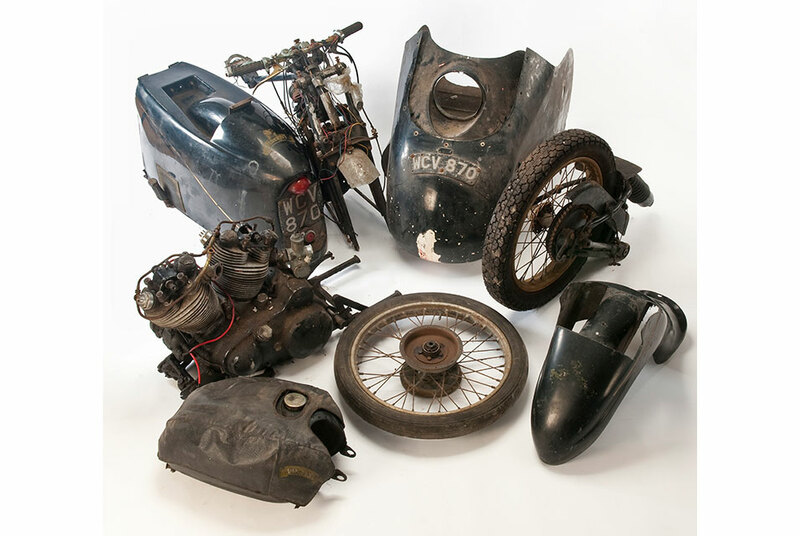 Other notable results included the two Rudge Multi’s – the first outstandingly original example selling for $44.800, whilst the second, a very rusty barn find example which was formerly the property of His Majesty King Onyeama of Eke, Nigeria, sold for $8.200. See more motorcycles and motocycle related lots on Barnebys here.